I’m going with three out of five for Rahasya. It’s a very watchable thriller, inconsistent but never dull. A compelling account inspired by an oddly fascinating case. Well, the movie is a good murder mystery presented in a thrilling manner with some good performances by its lead actors. As far as execution is concerned, while the unhurried unfolding of mystery adds depth to the film, it also demands patience from the viewers, which may or may not work in its favour. The strange and mysterious Aarushi Talwar murder case has inspired at least two films based on the botched up murky investigation. To make the film dramatic and interesting a lot of fictional characters are added for a good who-done-it murder mystery. In a busy Friday, when you have diverse movies releasing, you have one called Rahasya. Rahasya is not the perfect murder mystery. It has its drag moments and so if you have grown-up watching CID, you may like a better version of it. And such films do find audience in plexes but to have good word of mouth without any face value is tough task.Go for this one if you want edge of the seat experience! 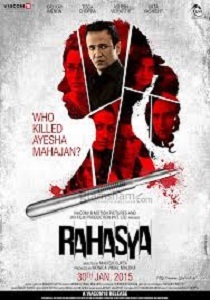 Rahasya movie is based on the infamous Arushi murder case. Filled with snaky twists and turns UVI Film Productions ‘Rahasya’ backed by Viacom 18 Motion Pictures is packed by an absorbing spin. Inspired by the famous Aarushi murder case, ‘Rahasya’ helmed by the talented Manish Gupta lives up to its demand of maintaining a dramatic rhythm and tension powered by terrific performance as the doctors of this genre ordered. Thanks to these brainy dry fruits, Menon, who plays the CBI chief, is able to solve the murder mystery.